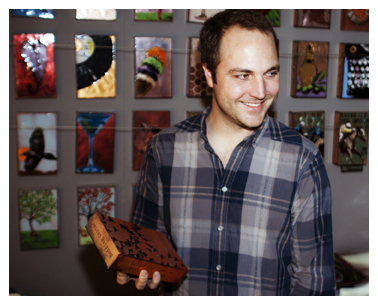 Houston Llew Spiritiles -- Artifacts Gallery is proud to represent the amazing spiritiles by artist Houston Llew. Houston Llew's Spiritile collectibles are created with molten glass on copper. Designed for free-standing or wall display, enhanced with words of wisdom from around the world, these unique works made wonderful gifts to honor special moments. Spiritiles creator Houston Llew was born in Nashville and educated at Auburn University in Alabama. After a restless period of wandering and experimentation with a variety of mediums, he fortuitously fell into the sphere of influence of enamel artist Zingaro in New Mexico. Apprenticing with this master craftsman provided the missing element to his personal artistic odyssey. Each Spiritile design wraps around all sides of the panel, offering a different glimpse from any direction. Terrific on their own, even better in multiples, these durable works can easily tolerate direct sun, humidity or even outdoor conditions. Display on a wall, or stand them on a mantelpiece or table--they are certain to spark a conversation. Colorful works like "Dream On" and "Ms." highlight the beautiful richly layered effects that can be achieved with glass enamel artwork. Artifacts Gallery is proud to present these gems of enlightenment to our collectors. New designs appear with the seasons, so visit the website often to see the seasonal releases of luminous Spiritile artwork!